I made this recipe using some tips and tricks from previous reviewers and from my experience having worked in an italian restaurant. This recipe does not have to be as time intensive as is recommended in the instructions. As another reviewer noted, it is not necessary to cook the noodles--just soak them in hot water while you are cooking the rest of the ingredients. You also do not need to cook the sauce. Sounds bizarre, but it's true. 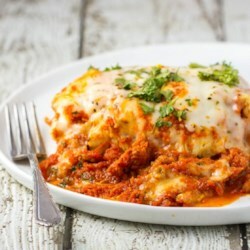 If you make the lasagna ahead and leave it in the fridge overnight, the flavors blend perfectly, no cooking required. For a chunkier tomato sauce, I subbed 1/2 of the crushed tomatoes with diced italian-flavored tomatoes. I layered everything in this order: sauce-noodles-ricotta mixture-sauce-meat-shredded mozzerella...i did 3 layers like this and then finished with a layer of noodles, sauce and shredded mozzerella and a generous sprinkling of parmesean on top. Following this method, I had the whole thing put together and in the fridge in less than an hour. It sat overnight and my husband had it in the oven when I got home from work. Fantastic recipe!